Amazon | What Does This Button Do? In my second column on Amazon’s Alexa service, I dig into how Alexa learns to understand and obey you. In my last column, I looked at how Amazon’s Echo device and the Alexa voice service allows you to control things with your voice. You speak, it understands and obeys. Alexa is just part of a new wave of services that allow you to control things with your voice, from cell phones to intercoms and thermostats. You can even do things now likeask her to start your car. So, how do these listening devices transform your mellifluous voice into computer commands? The answer lies in two new fields of computer science, called machine learning and natural language programming. In my latest Appliance Science column, I look into how Amazon’s Alexa service captures your voice and translates this into commands. There are plenty of things in my house that I yell at. Some of them answer back these days, though, and even do what I ask. My dog is still a work in progress as far as that goes, but my Amazon Echo has just about nailed it. 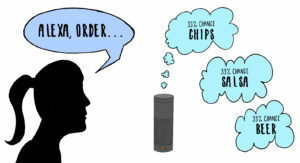 The Echo is a device that uses speech recognition to perform an ever-growing range of tasks on command. Amazon calls the built-in brains of this device “Alexa,” and she* is the thing that makes it work.